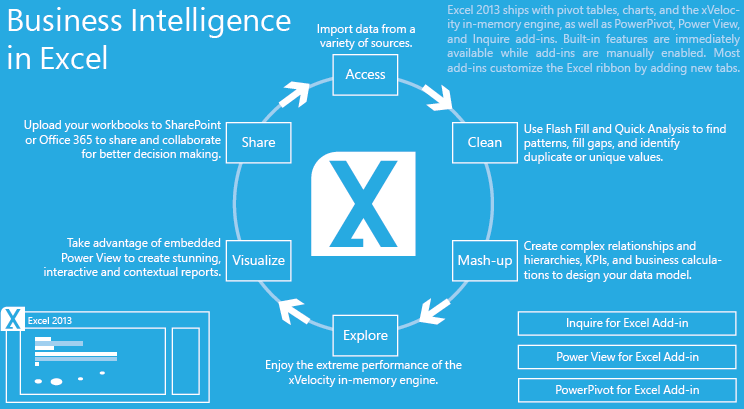 Microsoft put out a new poster to explain all of their Business Intelligence Tools and Components. In this article, I try to break down each of the sections in the poster to help make it easier to understand. Anyone who has tried to understand the full set of Microsoft Business Intelligence Tools knows that there are many pieces and it can be difficult to understand how they all fit together. You have Microsoft SQL Server as the core, SQL Server Analysis Services as the OLAP tool (SSAS), SQL Server Reporting Services as the canned Reporting Tool (SSRS), and SQL Server Integration Services as the ETL tool (SSIS). Then you can also add in Sharepoint, Excel, PowerPivot, Power View, Excel Services, Report Designer, and Report Builder. 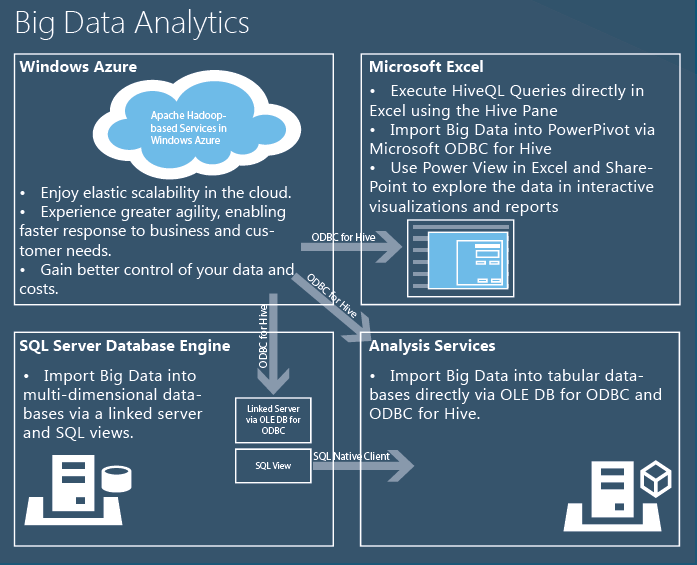 If you aren’t overwhelmed already, you can try to understand how all of this works in the Cloud with Apache Hadoop-based Services in Windows Azure, Microsoft Excel, HiveQL Queries, and Power View. That is a lot to take in, so Microsoft put out a nice poster to help group these technologies together. This is a big poster and they suggest that you print it on 44” x 34” paper. I thought it would be good for me to go through each section and make sure I understand what is really going on. The rest of this article simply breaks down the poster and links to the relevant content to help in understanding this poster. So, let’s take a look at a few of the sections. These are the tools that the end-user will see. *The print is too small to read in this image, but you can follow along in the downloaded document. 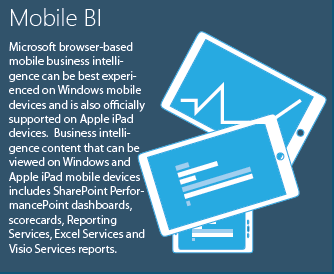 Microsoft starts by mentioning the Microsoft Excel as their “Self-Service BI tool of Choice”. Which is why you see the big circle around the X. The SQL Server Data Tools are used to help with your Visual Studio Development and to manage the different projects. 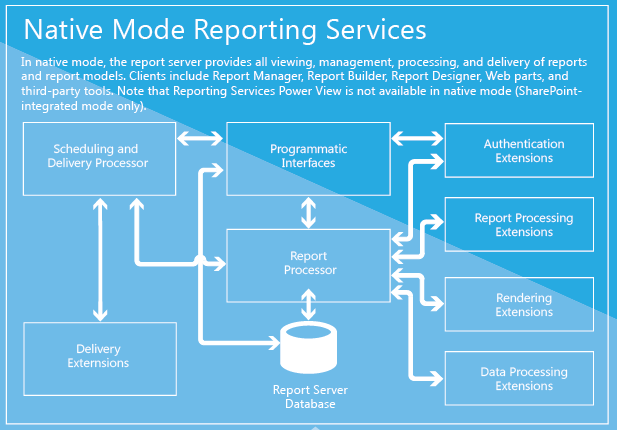 The Reporting tools section is based in SQL Server Reporting Services (SSRS), but also adds the Power View into the mix. For this sections, the 3 parts to focus on are very apparent. But, Power View is the newest toy. There are some add-ins for Excel and SQL Server for data mining predictive analytics. Now we are moving our way toward the behind the scenes programs. 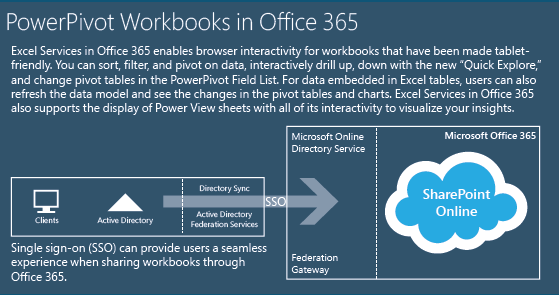 This is where the services run for Excel Services, PerformancePoint Services, Visio Services, PowerPivot for SharePoint, and Reporting Services Power View for SharePoint. 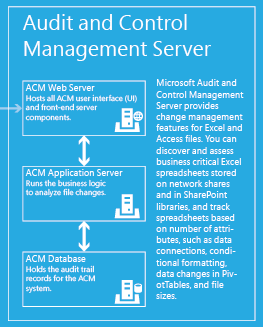 There is an audit control system or change management system to track what is going on with your office documents in Network Shares and SharePoint libraries. In the context of this poster, Information Sources bring in data from multiple locations and mash it together as an Information source that the end user can consume. Microsoft lists 2 different source types in this section. 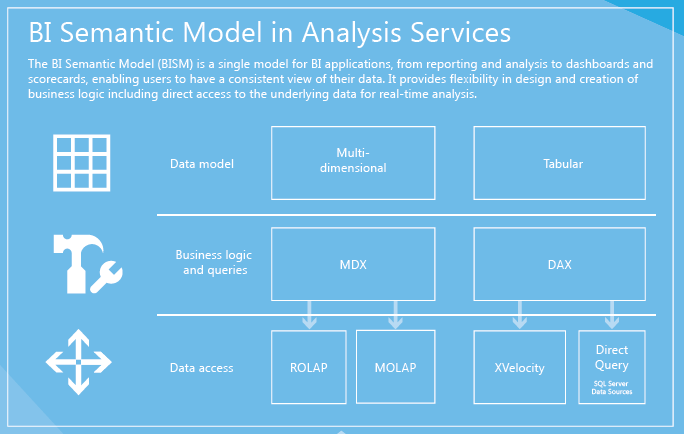 The BI Semantic Model in Analysis Services has two different categories in it. Multi-Dimensional and Tabular. Here are the main topics to understand from this portion of the diagram. This is the traditional SQL Server Reporting Services (SSRS). It is the standalone version and is not the Integrated Mode that runs with SharePoint. This means that it does not include Reporting Services Power View. This is a grouping of Data Sources that can feed the Information Sources layer. Here are a few of the highlights from this section. This section is a bit of marketing, but it helps to understand Microsoft’s focus in this document. Explore – They want you to know about Excel’s PowerPivot, Power View, and xVelocity. Visualize – They are doubling down on the new Power View, with a small focus on the flexibility with the data models. Control – This is all about Self-Service for the End-User. But, they don’t want to scare off IT, so they talk about monitoring and protecting BI assets. The right column is all about mobility, cloud and scalability. Let me take it from the top to the bottom. This section is about showing that you can view BI on your mobile device. Even the Apple iPad. Here are the list of items that are claimed to be available on mobile. This is more mobility. You can share your Excel PowerPivot workbook up to Microsoft Office 365 and then you can use your browser to interact with it. 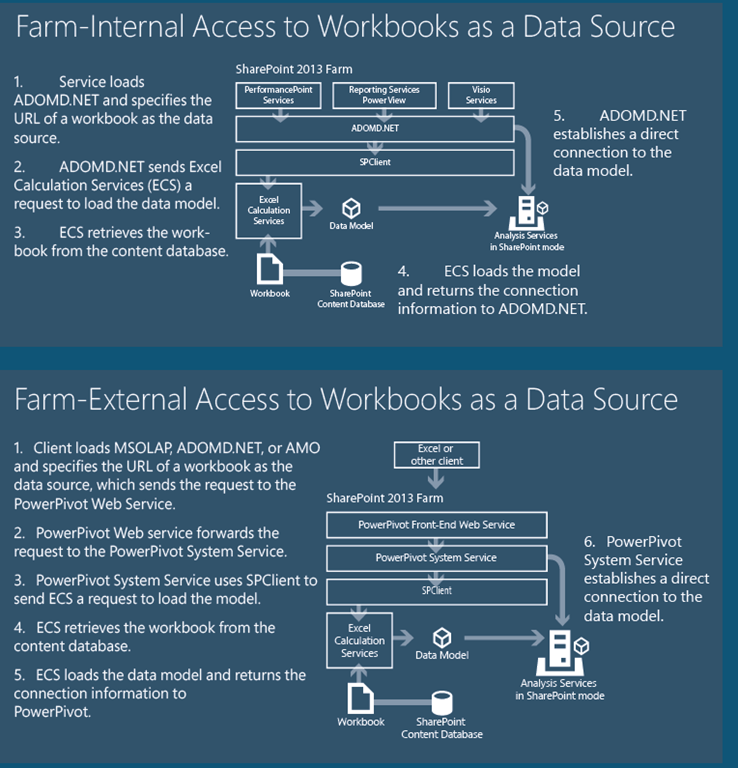 These two images talk about the SharePoint 2013 Farm and show the technical layers involved with both the Internal and External setup. 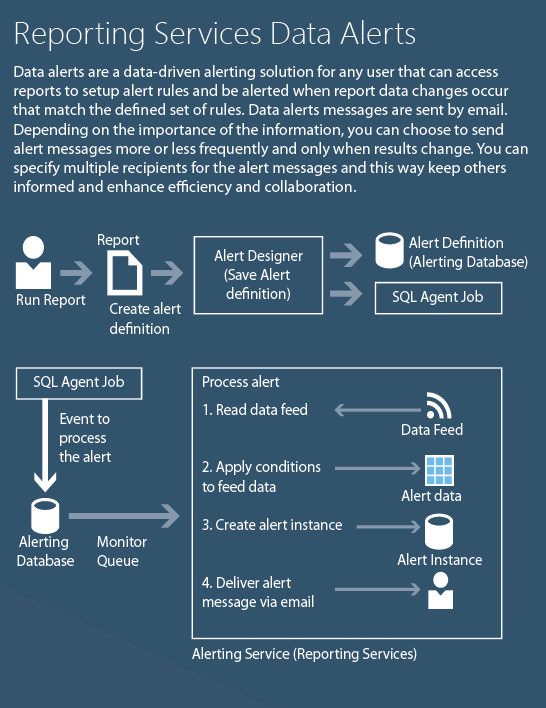 This section talks about the ability of Integrated Reporting Services (SharePoint mode) to alert you when data changes on a report. The point is so that you don’t have to look at a report until something happens and then the report is pushed (emailed) to you. This section of Microsoft’s Report focuses on the Apache Hadoop-based Services in Windows Azure and how it can feed Microsoft Excel, SQL Server Database Engine, and Analysis Services. Without being too redundant with the rest of this blog post, here are a few links from the focus on this image. 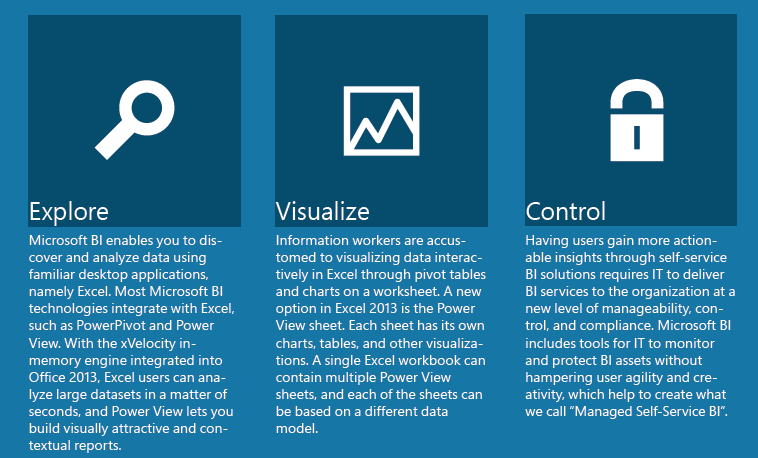 Microsoft’s new Business Intelligence at a Glance Poster is a good way to become familiar with all of the parts involved with Microsoft’s BI solution.